The publication A Trip Through the Colortype Plant of Zeese-Wilkinson Company (1916) is available on the internet as a google book. This includes a photo of the Zeese-Wilkinson building at 424-438 W. 33rd St. The introduction includes, "The Zeese-Wilkinson Company has specialized in color plate engraving and operates one of the largest colortype plants in this country. It has a reputation for producing color work second to that of no house in the United States. Its statements on all matters pertaining to process work are based on the scientific knowledge and extensive practical experience of Gustav Zeese and W. J. Wilkinson. The former has been identified with process engraving since its introduction into the United States. The latter has had the benefit of years of thorough training in the foremost establishments of France, Germany and England. Back of these two men is an organization of trained experts in every department." Zeese-Wilkinson were formed in 1904 and were located at 213 E. 24th St. until 1914. From 1914 to 1920 they were at 424-438 W. 33rd St., then relocated to Thompson Ave. in Long Island City in 1921. They stayed in business here until 1950. The partners were Gustav Zeese (1867-1930) and William James Wilkinson (1877-1956). Gustav Zeese applied for a passport in 1920 where he said that he was born in Witten, Germany, 20 Oct. 1867, that he emigrated from Antwerp, Belgium, 1 Sept. 1882, and that he became a naturalized citizen of the U. S. in Chicago, 17 March 1890. Gustav Zeese's obituary in the New York Times, 19 June 1930, read, "Gustav Zeese Sr., retired member of the firm of Zeese-Wilkinson Company, color printers and photo engravers, died suddenly yesterday at his home in Great Neck, L. I. He was in his sixty-third year. Funeral services will be held tomorrow evening at 8:30 in the Community Church, Third Avenue and Stoner Street, Great Neck. Mr. Zeese was born in Germany and came to this country as a young man. He first resided in Milwaukee and later in Chicago, where he was in the engraving business for several years. In 1900 he came to New York and in 1904 joined in organizing the firm of Zeese-Wilkinson Company. He retired about five years ago. He had been active in community affairs in Great Neck and was a member of Ancient Lodge 724, F. and A. M. He is survived by a widow, Mrs. Amalie Zeese and five sons." William J. Wilkinson was born in Amsterdam, Nederland, 17 August 1877, immigrated to the U. S. 1903 and became a partner with Gustav Zeese the following year. He registered for the World War I draft in 1918 when he lived in Great Neck, Long Island, and was employed at Zeese-Wilkinson, 424 W. 33rd St. In 1923 Wilkinson's wife, Elsie, sued for divorce: "Supreme Court Justice Tierney yesterday granted an application by Mrs. Elsie F. Wilkinson for a divorce from William J. Wilkinson, head of a color printing company, as the result of a verdict by a jury before Supreme Court Justice Mahoney recently that Wilkinson had been guilty of misconduct. Mrs. Wilkinson named three women who had attended parties in Wilkinson's apartment. Testimony was given by a Japanese butler formerly employed by Wilkinson" (New York Times, 28 June 1923). A year later Elsie Wilkinson (Elsie F. Olson) married William Schlemmer of Hammacher, Schlemmer & Co. From the death of William Schlemmer in 1945 to 1953 Elsie Schlemmer ran the business on East 57th St. This ad from 1909 dates from the time when Zeese-Wilkinson as located at 213 E. 24th St. This later ad from 1918 dates from when they were located at 424 W. 33rd St. This letterhead dating from 1919 indicates that their building at 424 W. 33rd St. housed both offices and the printing plant. In 1922 the journal The Printing Art, vol. XXXIX, no. 4, June, 1922, published this print as a sample of Zeese-Wilkinson color printing. By this time the company was located in Long Island City. This ad appeared in The American Printer, July, 1922. 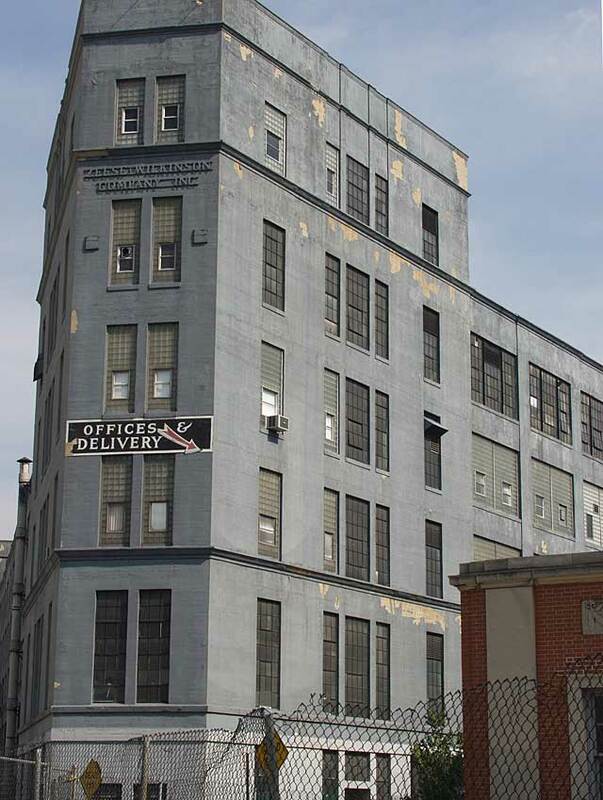 The Zeese-Wilkinson building on Thompson Ave. was known as the Metropolitan Building.